In a significant advance, a research group from IBM successfully applied their new "controlled spalling" layer transfer technique to gallium nitride (GaN) crystals, a prevalent semiconductor material, and created a pathway for producing many layers from a single substrate. "Our approach to thin film removal is intriguing because it's based on fracture," said Stephen W. Bedell, research staff member at IBM Research and one of the paper's authors. "First, we first deposit a nickel layer onto the surface of the material we want to remove. This nickel layer is under tensile strength—think drumhead. Then we simply roll a layer of tape onto the nickel, hold the substrate down so it can't move, and then peel the tape off. When we do this, the stressed nickel layer creates a crack in the underlying material that goes down into the substrate and then travels parallel to the surface." "A good analogy of how remarkable this process is can be made with a pane of glass," Bedell said. "We're breaking the glass in the long direction, so instead of a bunch of broken glass shards, we're left with two full sheets of glass. We can control how much of the surface is removed by adjusting the thickness of the nickel layer. Because the entire process is done at room temperature, we can even do this on finished circuits and devices, rendering them flexible." The group's work is noteworthy for multiple reasons. For starters, it's by far the simplest method of transferring thin layers from thick substrates. And it may well be the only layer transfer method that's materially agnostic. "We've already demonstrated the transfer of silicon, germanium, gallium arsenide, gallium nitride/sapphire, and even amorphous materials like glass, and it can be applied at nearly any time in the fabrication flow, from starting materials to partially or fully finished circuits," Bedell said. "The basic mechanism of substrate spalling fracture started out as a materials science problem," he said. "It was known that metallic film deposition would often lead to cracking of the underlying substrate, which is considered a bad thing. But we found that this was a metastable phenomenon, meaning that we could deposit a thick enough layer to crack the substrate, but thin enough so that it didn't crack on its own—it just needed a crack to get started." 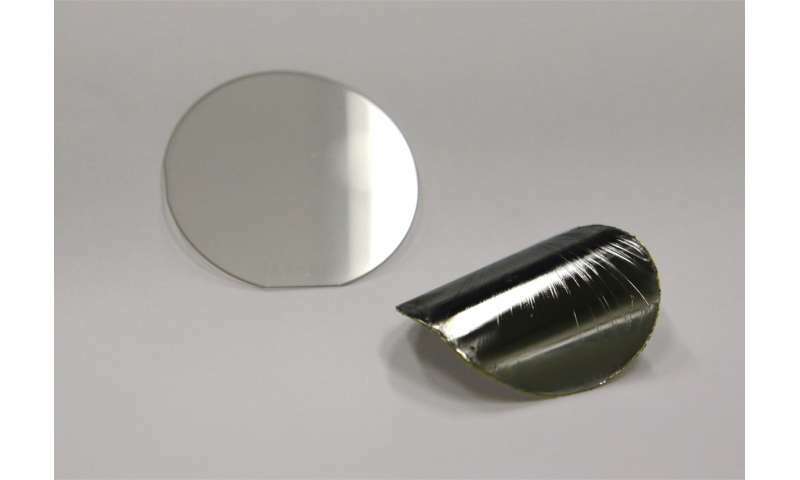 "This creates a large stress discontinuity at the edge of the nickel film so that once the tape is applied, a small pull on the tape consistently initiates the crack in that region," he said. 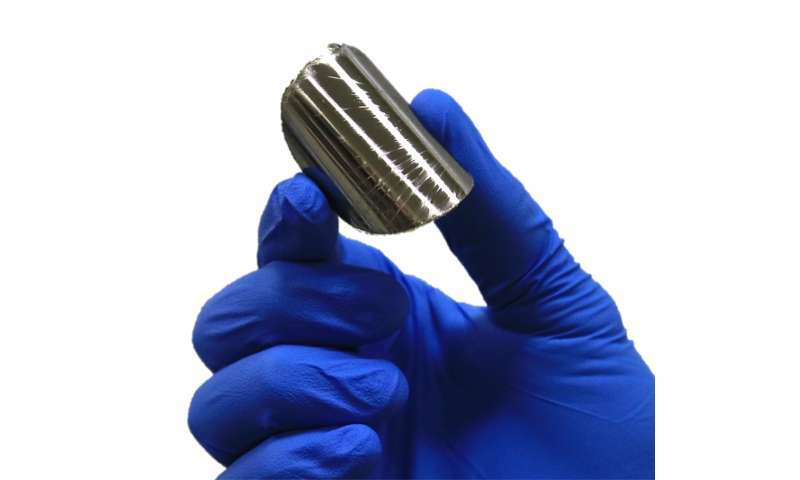 Though it may not be obvious, gallium nitride is a vital material to our everyday lives. It's the underlying material used to fabricate blue, and now white, LEDs (for which the 2014 Nobel Prize in physics was awarded) as well as for high-power, high-voltage electronics. It may also prove useful for inherent biocompatibility, which when combined with control spalling may permit ultrathin bioelectronics or implantable sensors. "Controlled spalling has already been used to create extremely lightweight, high-efficiency GaAs-based solar cells for aerospace applications and flexible state-of-the-art circuits," Bedell said. The group is now working with research partners to fabricate high-voltage GaN devices using this approach. "We've also had great interaction with many of the GaN technology leaders through the Department of Energy's ARPA-E SWITCHES program and hope to use controlled spalling to enable novel devices through future partnerships," Bedell said.